This is the second of two blog posts discussing dynamic education and digital tools. Previously, factors to consider when creating a learning interaction were examined. 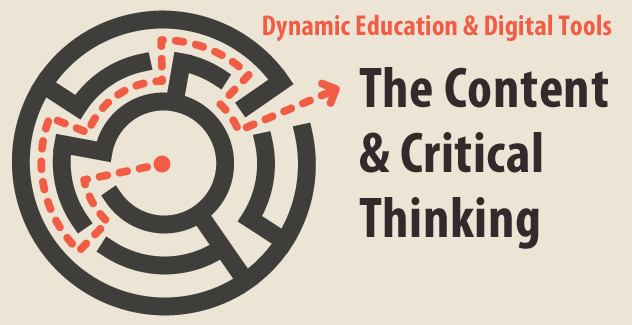 In this post, specific examples of these factors are shown as well as digital tools and how they play a role in critical thinking on behalf of the students. Creating appropriate digital content and lessons depends on the subject matter. Keeping in mind, the aforementioned areas, I shall try to concentrate on the main theme of an interaction. It is the “engagement” aspect, which, as I touched on earlier, is an interactive piece of content, lesson or assessment that motivates the student to think. The role of the interaction creation tool is to accommodate the design of the interaction with adequate resources and ease. Linked to external multimedia, to instigate deeper exploration. The following is an example of content, designed with SoftChalk Cloud, that explores the topic of “Global Warming, discussed in Social Media". The content is a simple Copy & Paste from a Forbes Contributor article, that I have used in this example. 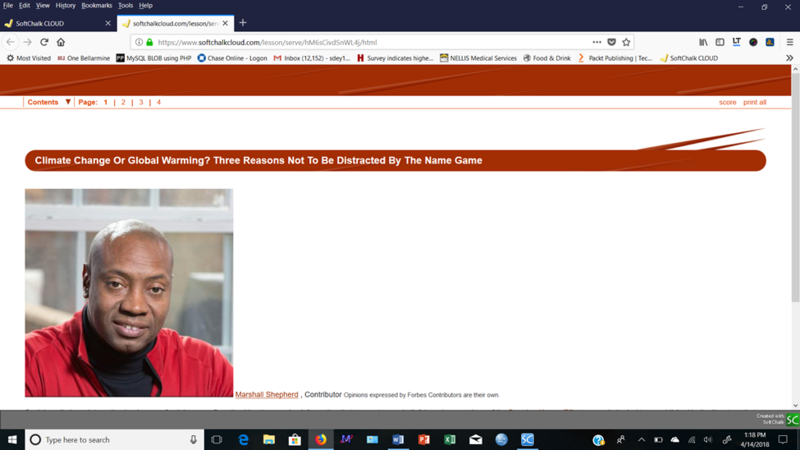 I have searched for an appropriate topic, somewhat applicable to various levels of education and copied and pasted the content from the online article. SoftChalk maintained the content format, hyperlinks and displayed the discussion using a design template. I elected a design style from a library of good-looking and navigable templates that come with the software. For many students, the topic of “Global Warming” is not well understood, let alone how confirmation bias plays a role in identifying the weather fluctuations as climatic change or manifestation of a greater landscape like global warming. One can learn several important geological and perceptual paradigms from Mr. Shepard’s contribution. The Dunning-Kruger Effect and GIS Temperature anomaly analytics are just a few that he utilized to augment his arguments about social media’s (miss) representation of the topic. The main theme remains to be “Global Warming”. I decided to insert a well-done video clip from YouTube. In SoftChalk, it is fairly easy to click and insert a video widget from various URLs or Open Educational Resources (OERs). The process of modular learning is incomplete without some form of assessment. This is an important element of Digital Learning and must be challenging—commonly known as Critical-Thinking skills. There are many form of assessment in SoftChalk along with games and puzzles. 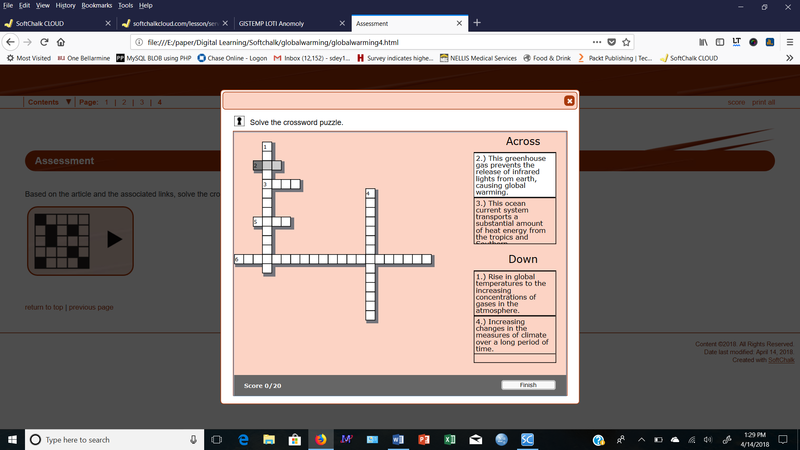 I decided to use a Crossword puzzle to measure students' overall understanding of the concept. The battery of these elements, in my mind, craft an engaging digital learning component. As the student clicks into the lesson, he is exposed to the lesson's front-page, which can be hosted anywhere in the Cloud, including SoftChalk Clouds’ own OER repository, SoftChalk Share. One can make it publicly accessible or private and secured. These are technical discussions beyond the boundaries of this segment. 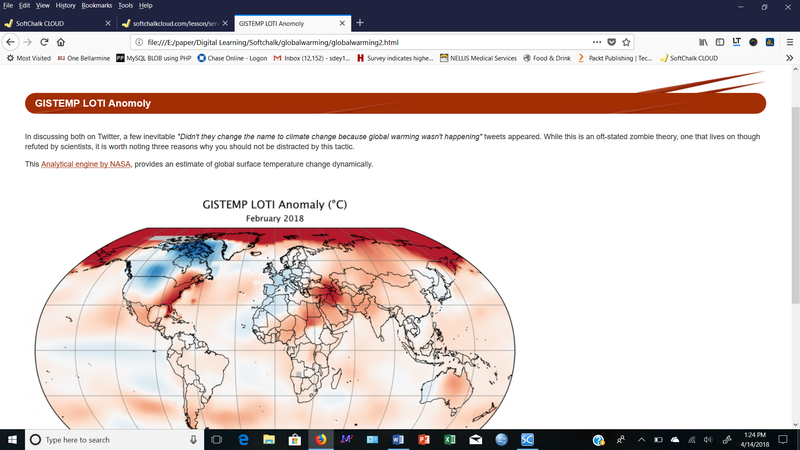 Students may click on a Link called "Climate Change or Global Warming" and get to the front page. The link can be placed in the LMS or an appropriate section of the syllabus. I think, the automatic synchronization of the lesson with SoftChalk Cloud is one of the best features in the tool. 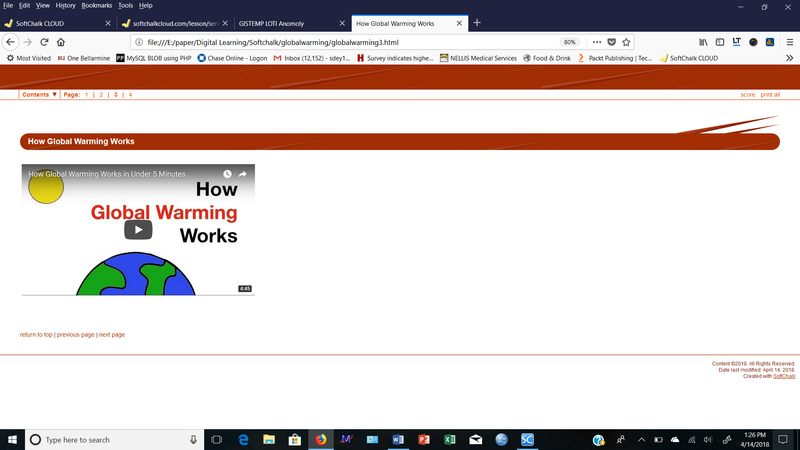 Those of us who are a bit technologically acquainted, can appreciate the time, process and security of uploading an entire directory of a responsive mini-site (lesson) in an external server. SoftChalk saves it in a randomly created URL with all interoperability needed, along with generating a private URL, dedicated to the user. That URL stays fixed even if you make modifications and re-save it. For the students, from one term to another, that remains seamless. Needless to say, this helps minimize broken links and poor interoperability, which are two major problems in digital education. Digital Learning Day gives a good explanation of digital learning. Digital learning is any instructional practice that effectively uses technology to strengthen a student’s learning experience. [i] The question remains, how to measure the strengthening aspect of learning? Is it the digital platform, visualization, interactivity or simply an individual student’s comfort level with technology? We need more granular research. At least, in my opinion, with AI based data science strategies, one might find better answers of the root-causes with Artificial Neural Networks and Machine Learning. We then can apply predictive models to gain a better understanding of who will learn better under a digital scenario or a traditional one. It is almost saying that some learn better with a textbook and a good lesson plan. The other gets easily engaged with a digital interaction and thus manifests a better learning outcome with a digital device. Effective education is, slowly but surely, leaning towards customized models. We have to do a better job in identifying the independent attributes that influence the learning outcomes at every level. SoftChalk certainly plays an important role in that global research domain. I support (with confidence) based on my academic, teaching and technological experience that engagement serves as a strong mediator to prompt ‘focus or a span of attention’. My logic subsequently supports the notion that a good digital lesson planner/designer certainly improves the probability of interdisciplinary engagement. Furthermore, digital lessons can be created with a tool like SoftChalk more efficiently, attractively and at a lesser time. The exercise that I have illustrated here, in my technical opinion, would require significantly more time from a programmer with a subject matter expert, if approached with a responsive on-line framework, from scratch. What might be emerging is Artificial Intelligence. It is already possible to develop effective lessons at a significantly reduced time and cost, using an educational tool like SoftChalk. If one can also embed the algorithms of Machine Learning, Predictive Models and Neural Networks into an educational tool like SoftChalk, it may be possible to assign a predictive probability to each lesson as per its contribution to the learning outcome. The two most important factors, either in pre or post-secondary educations today, are improved learning outcomes and cost control. SoftChalk seems to have emerged as a technology to impact both aspects. I am certain, there’s more to come. 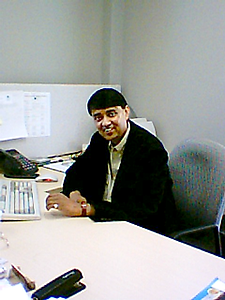 Professor Sukhen Dey serves as an Associate professor of Computer Science at Bellarmine University, Louisville, KY. He served as an Associate Professor of Computer Science and Informatics at Indiana University, SE. He holds a doctorate degree in System Sciences, an Education Specialist degree in Higher Education and an MBA, all from the University of Louisville. He is an expert in systems analysis, database development, cyber security, analytics and health informatics. He has published and presented numerous papers in his areas of expertise He serves in various editorial review boards including The World Health Organization Bulletin and International Journal of Healthcare Information Systems and Informatics (IJHISI). Professor Dey is a Life Member of Cambridge Who’s Who.